Phosphorus is the second most abundant mineral in the body, behind calcium. In your body it is primarily found in the form of phosphate. Every cell in your body needs phosphorus to function properly, but 85 percent of the phosphorus is stored in your bones. While phosphorus is an essential nutrient, getting too much can be bad for your health. Soft drinks are a source of phosphate, and knowing the amount different varieties contain can help you adjust your diet to prevent toxicities. Your daily phosphorus needs vary depending on your age. Infants 0 to 6 months need 100 mg of phosphorus a day, and 7 to 12 months 275 mg a day. Children ages 1 to 3 years need 460 mg a day, and 4 to 8 years 500 mg. Children and teens 9 to 18 have the highest needs, requiring 1,250 mg of phosphorus a day. Adults 19 and older need 700 mg phosphorus a day. Blood calcium and phosphorus levels are both regulated by the parathyroid hormone. 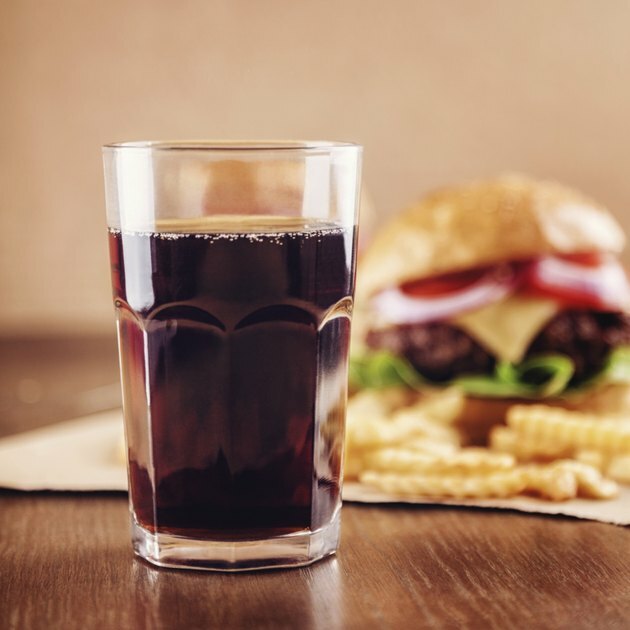 However, phosphorus levels are not as tightly regulated as calcium in your blood, and levels can rise quickly if you consume too many high-phosphorus foods, like soft drinks. High blood-phosphorus levels prevent your body from stimulating the conversion of vitamin D into calcitriol and from absorbing adequate amounts of calcium. This leads to a reduced blood calcium level and an increase in the release of the parathyroid hormone. High levels of parathyroid hormone stimulate bone resorption, or demineralization, which can weaken your bones. However, poor bone health is only seen in humans when a high-phosphorus diet is coupled with a low calcium intake, according to the Linus Pauling Institute. Although there seems to be a lot of concern about phosphorus in the diet from soft drinks, most soft drinks are not a significant source. A 12 oz. can of cola with caffeine contains the most with 37 mg of phosphorus, while the same size serving of diet cola with caffeine contains 32 mg. Cream soda, ginger ale and root beer are all phosphorus free. Milk and yogurt contain more phosphorus than soft drinks. An 8 oz. serving of skim milk has 247 mg, and an 8 oz. serving of yogurt 385 mg.
For bone health, you need to balance your phosphorus intake with your calcium intake, according to the University of Maryland Medical Centers. The Western diet typically contains two to four times more phosphorus than calcium. While soft drinks are often to blame for this imbalance, it may not be not that the drinks contain too much phosphorus but rather that they are replacing calcium-rich beverages such as milk.